In a scene from the classic flick, Bull Durham, a puppy dog-faced Nuke Laloosh protests to grizzly catcher, Crash Davis, that he wants to announce his presence with authority. See the clip here. This clip perfectly captures the essence of youthful exuberance mixed with misguided overconfidence. Though I am not sure overconfidence is ever properly guided. Young players are always eager to show the world their skills. Here is hoping the Ponder and Rudolph show has a lot of seasons left. In response to his young pitcher’s stubborn pronouncement, Crash informs the hitter of the fastball that is coming and the hitter promptly parks it over the right field fence. This scene is also a great example of the struggle that most players go through on their way to the show. This is true for most sports. Many young players have a difficult time initially applying their skills at the highest level. For many, it is their experiences in defeat that motivate them to be better. For Vikings fans, we are lucky enough to get to watch not one, but two, young players go through this very process. Last Sunday’s dominating victory over the 49ers of San Francisco, one of the best teams in the NFC, was a coming out party for a young Vikings squad. The lead roles in that victory were played by second year players Christian Ponder and Kyle Rudolph. Ponder threw two TDs (both to Rudolph) and ran for another. 2011’s manuscript was almost completely devoid of any happy endings. The squad went 3-13 and there was very little that fans could get excited about going into 2012. During training camp, there were whispers that Ponder had developed a strong bond with Rudolph; they were in the same draft class and were rookies together. And, on the field, the two looked very much in sync. More than ever, a QB’s ability to play pitch and catch with his receivers is critical to a team’s success. Just ask any of the talking heads on the four letter network. Rudolph has quickly established himself as Ponder’s security blanket. When Harvin is covered, Ponder looks for his 6’6″ tight end. You always get the sense that, if everything goes to hell, Ponder could just sling near Rudolph and he will make a strong play for the ball. Through 3 games, Rudolph has 18 targets and 13 receptions. Of his 13 snags, Rudolph has three TDs. Considering his imposing frame and monster mitts, he is a match-up nightmare. It is still VERY early, but if Ponder continues to look for Rudolph in clutch situations, Rudolph has the pedigree to join Graham and Gronk as a premiere tight end in the NFL. 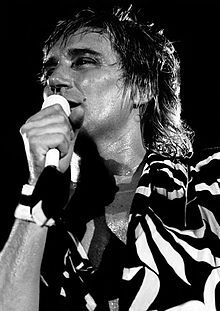 It was Uncle Rod who sang that he only had eyes for you. Am I embarrassed that I just made a Rod Stewart reference in this piece? Not one bit…okay….maybe a little. A great example of Rudolph’s emerging skills were on display on his second TD. On the play, AP was WIDE open in the end zone. Like, not even Tavarius Jackson could have incompleted that pass. But, Ponder only had eyes for Rudolph. He trusted his battery mate enough, throwing the ball behind the defender and Rudolph made a great catch in the back of the end zone. It is that mixture of trust and athleticism that could separates Rudolph and Ponder from the other QB/TE combos in the league. 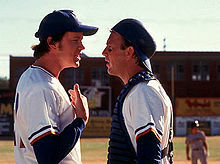 Now, just like Nuke Laloosh’s journey in Bull Durham, the growing pains are nowhere near over. There will be Sundays, and maybe even Thursdays or Saturdays, where Rudolph and Ponder will want to announce their presence with authority and the team will struggle. But, just like you got emotionally invested in the Bull Durham characters, Vikings fans have to be excited about the prospects of watching Ponder and Rudolph make the journey. I know I sure am. In fact, would someone pass the popcorn, this is going to be good. This entry was posted in Home, Vikes v. Pack and tagged Bull Durham, Cheech Harvin, Christian Ponder, Crash Davis, Gronkowski, Jimmy Graham, Kyle Rudolph, Minnesota Vikings, Nuke Laloosh, Tavarius Jackson, Tavarus Jackson, Vikes. Bookmark the permalink.